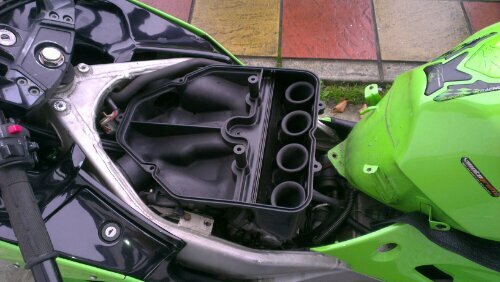 Busy morning sorting out the airbox on Mary’s ZZR400. It had a bad seal where the underside marries up to the top of the throttle bodies, a gaping space along the rear edge. This has been causing running issues at high speed, where the ram air setup needs to be pressurised to ensure the floats let the right mix of fuel and air into the engine. Without the necessary pressure the fuel mix has been far too rich. I picked up a new airbox on the off chance the current one was slightly warped. I also got a new duct seal, as the old seal was very squashed and not doing its job. Swapping the box over was mostly straight forward, with only removing/replacing the tank and getting the ram air ducts at the front lined up into the box being particularly tricky. All went well until a fuel line split – doh! Just at end near the clamp onto the reserve valve, so I was able to shorten it and make good. Phew!